Windtech Consultants have had the privilege of being a key consultant with respect to wind engineering services for a number of projects within the Perth CBD precinct. Past and/or ongoing projects include: Mirvac OTB Office and Treasury Hotel, 18 The Esplanade, 580 Hay Street, Queens Riverside and the Burt Way Hotel and Residential Development. 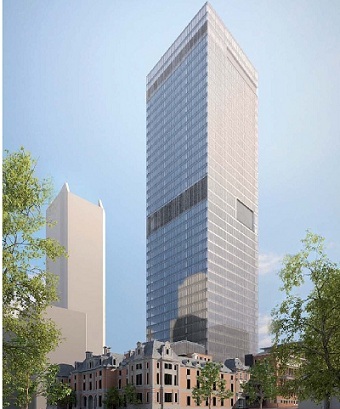 For the Mirvac OTB Office and Treasury Hotel project, Windtech Consultants conducted the Structural Loads and Building Motion Studies using the High Frequency Force Balance Technique (HFFB). These tests enabled an accurate and definitive determination of the wind loads on the structural frame, as well as a set of equivalent-static load cases, on the tower of the development. The study also provided an assessment of occupant comfort due to building motion against three different sets of published criteria. This study enabled the identification of the wake interference effects generated by the existing high-rise buildings to the south-west of the site. A Façade Cladding Pressure Study was also undertaken to determine the cladding design pressures for the façade engineer. In general, the wind tunnel results represented pressures which were lower than predicted by the code estimate, but also took into consideration the pressure “hot spots”. This enabled the façade engineer to optimise the design of the façade over the entire building envelope. A Pedestrian Wind Environment Study was undertaken for the existing conditions as well as with the inclusion of the subject tower development. This study enabled the identification of areas directly affected as a result of the proposed tower development, and enabled optimal treatment solutions to be formulated for the client. We investigated ameliorative measures such as trees, shrubs, awnings, etc in consultation with the client and project architect. Further to this, Windtech investigated the wind conditions for existing surrounding areas, such as the Treasury Hotel. Wind Entry conditions for proposed redevelopment of the ground level of the hotel was undertaken to help ensure the main internal space linked to numerous openings was suitable for patrons. 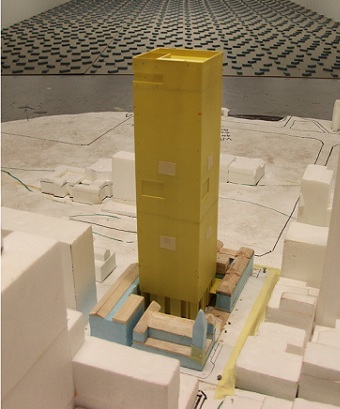 Windtech also carried out dispersion modelling from selected exhaust locations on both the tower and Treasury Hotel. This study was carried out to ensure that exhaust gases were not recirculated to intake locations as well as not be directed to sensitive outdoor areas. Further to this, Windtech carried out a wind-noise assessment on the proposed external façade fin features on three aspects of the tower. The assessments involved carrying out a detailed review of the design and provide expert advice to ensure whistling due to wind flow was not generated.